Once you are able to improvise on the guitar using scales such as the minor pentatonic, it is important to look at how you can improve your phrasing. It’s said that BB King could make his guitar really sing, so what you want to do is to be able to make your guitar solos expressive. The best blues guitarists are known not because of their technical skills or how fast they can play but by their very recognizable, personal style. The most important factor here to develop that personal style, is to improve your phrasing. The worst that can happen is that you stay improvising with the minor pentatonic scale using no contrasting elements and little to no expressive techniques, which is something a lot of guitarists struggle with once they get familiar with that scale. You tend to always stick to the same patterns and ways to go up and down the scale, which makes your solo bland and boring. There’s nothing really wrong with sticking to the same scale for your solo but then it is absolutely vital that your phrasing is interesting. Many great solos exist using very few scales. A good example is Miles Davis’ solo in ‘So What’ from the legendary album ‘Kind of Blue’, he uses only a few simple scales but the way he uses contrast in intervals (melody) and more importantly, rhythm, is what makes it one of the greatest solos of all time. In this article you will learn how you can add this kind variety to your phrasing. Let’s first talk about contrast. Contrast per definition means the difference between two opposites, like light vs. dark. In music this can be extended to the difference between two parts or different instrument sounds. Typically the three types of contrast are rhythmic contrast, melodic contrast and harmonic contrast. This concept is important for your guitar playing not only because it adds interest to your soloing but it is also essential for the aesthetic illussion of dramatic resolution of conflict. To put it simple : it will help you tell a story, which is exactly what phrasing is about; the way you tell the ‘story’ of your solo. If you’re not telling a story in an interesting and captivating way, listeners will not be engaged. A real life example we are all familiar with is when a teacher who speaks in a monotonous voice just ‘dumps’ the info on you and basically put you to sleep with his words. There’s no interesting story being told. A teacher who brings his lesson/story to life with a lot of expression will get much more engagement and his story will stick. This is exactly the same when you a play a guitar solo. In addition to this article I would recommend you to study my my how to play guitar with feeling Guide. Let’s now focus on bringing that contrast to life through rhythm used in your improvisation. Most beginner to intermediate guitarists only use binary rhythm in their improvisations. Being able to combine different kinds of rhythms or different kind of notes will already give you a big leap towards diversity in your playing. 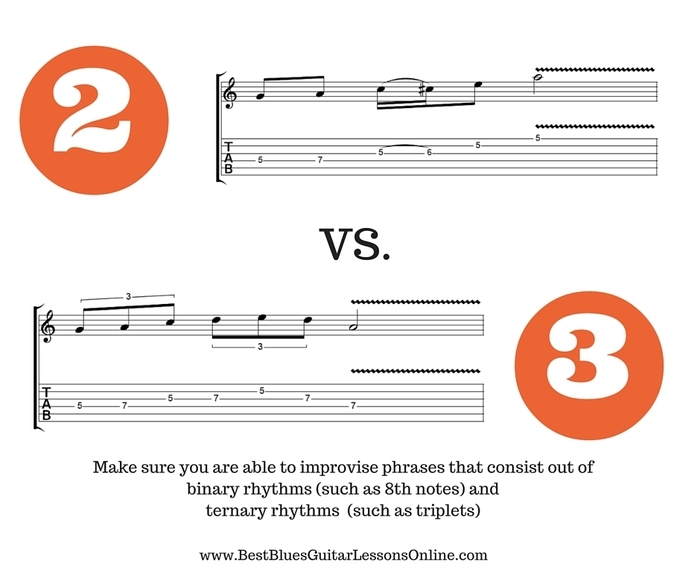 So lets take a look at two different types of rhythm that you can use and combine: binary and ternary. What binary basically means, as the name suggests (‘bi’ means two), is a rhythm that can be divided by 2 or 2 ‘sections’. For example, when we take 1 full measure of 2/4 with 2 quarter notes as shown in the example, you can see that the measure can be divided in 2 sections. This also applies for 4/4 and 6/8 for example, all can be divided by two and are thus binary rhythm, with 4/4 being the most widely used meter in popular/contemporary music. This same concept of dividing by 2 or 3 can also be applied to individual note values, such as quarter and eight notes in binary vs. triplets and sextuplets in ternary rhtyhm. By combining these two in your improvisation you will add a lot of dynamic and interest to your solo instead of sticking to the same values. For example using triplets in a 4/4 time signature instead of always using quarter or eigth notes, will completely change the feel. Let’s look at two licks, one consisting out of binary notes, one of ternary notes. Here I am using all rhythms that can be divided by two, such as eight notes (two notes per beat) and sixteenth notes (four notes per beat). In this lick we incorporate rhythms that can be divided by three, such as triplets (three notes per beat). If you want to create interesting, forward-moving solos you need to be able to integrate ternary rhythms as well as binary rhythms in your improvisations. Here is an example solo where you can hear how these concepts sound. In the first example you will hear that in the first part of the solo things aren’t really propelling forward, since I am playing eight notes rhythms (2 note per beat) for the most part. Notice how this solo sounds much more mature then the first part of the example solo 1. These are ultimately very simple ideas but can make all the difference between a boring and an interesting solo, so focus on the different feels between these two rhythms and incorporate them in your practicing, it provides you with a lot more range and tools for your ‘story’ and thus your general improvisation. A good exercise to get a better grasp of this idea is to take some licks or solos from your favorite guitarists and try to change the notes from binary to ternary or visa versa, since you know these licks or solos really well it will be very clear where the difference lies. In addition to this phrasing article you should study my guide on how to play emotional guitar solos. 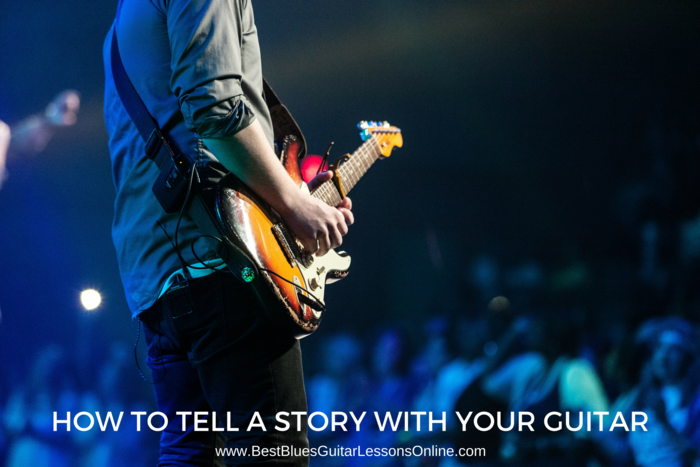 Is your blues guitar soloing stuck in a rut? Learn the approach that will get your blues guitar solos sound great in my blues guitar soloing lesson.